It is found that when 4-dimensional theory is formulated in a 5-dimensional space-time, novel features emerge as the theory is reduced back to 4-D. The Kaluza-Klein theory introduced in the 1920s is the most famous example, which unifies the theories of gravitation and electromagnetism. The technique of compactification to hide the extra-dimension is now used extensively in the superstring theory. It is from the process of compactification that produces various particle properties. , and the index runs from 1 to 4 (with the 4th index identified to the time component). which is just the 4-D space-time Klein Gordon Equation with effective mass = (n / R). This is a very simple example of Kaluza-Klein tower (also known as KK particles, KK modes), which in effect is the energy of the standing waves in the extra compactified dimension (Figure 10s). In the n = 0 mode, the KK particle will be indistinguishable from the known particles. The lightest KK particle corresponds to n = 1; it would have the same charge as the known particles but different mass. If experimenters discover new heavy particles with the same charges as familiar ones and masses that are similar to one another, those particles will be strong evidence of extra dimensions. If such particles also occur at regular intervals of mass, it would very likely mean that a simple curled-up dimension has been discovered. But more complicated extra-dimensional geometries will yield more complicated patterns of masses. If enough such particles are discovered, the KK particles would then reveal not only the existence of extra dimensions, but also the their sizes and shapes. Since no KK particle has been detected so far, it seems to indicate that the size of the curled-up dimension could be very small. In unit of ev, the mass of the KK tower Mn = (n/R) x 1.2 x 10-4 ev. Thus, the new LHC collider (to be operational in 2007) with available energy up to 14 Tev can probe the curled-up dimension down to the size of about 10-17 cm. The compactification of a dimension creates a quantization of the momentum corresponding to the compactified coordinate. The momentum is labeled by integers. The mass spectrum in the space-time dimensions that are not compactified is shifted by an effective mass term coming from the compactified dimension. The radius of the compactified dimension can be totally arbitrary as long as it can hide that dimension from observation. In general the components with from 1 to 4 will recover the original theory with additional term. The = 0 component will generate some kind of physical property. In some other theories when there are cross terms between the = 1, ...,4 and the = 0 components, other theories will emerge from the reduction. The extra dimension is not curl-up and satifies the periodic condition. It is proposed instead that gik should not depend on x0, which implies g00 is a constant. The reduction of the ( , ) (from 1 to 4), (0, ), and (0, 0) components of the curvature tensor respectively generates the gravitational, electromagnetic, and scalar fields. The reduced equations for gravity is similar to the original gravitational field equations in Eq.(12a). The additional term is the electromagnetic stress-energy tensor, and k ~ g00 is the gravitational constant. The electromagnetic equations are modified by a factor of (-g)1/2, where g is the determinant formed from gik. F = g0 , - g0 , is the electromagnetic anti-symmetric tensor defined in the original equations. Indices separated by a comma will denote differentiation with respect to the corresponding coordinate. The massless scalar field is called radion or dilaton. It can be interpreted as the length or size of the fifth dimension as a function of the usual four dimensions of space-time. In string theory, the dilaton always appears together with gravity. where 0 is the mass density. 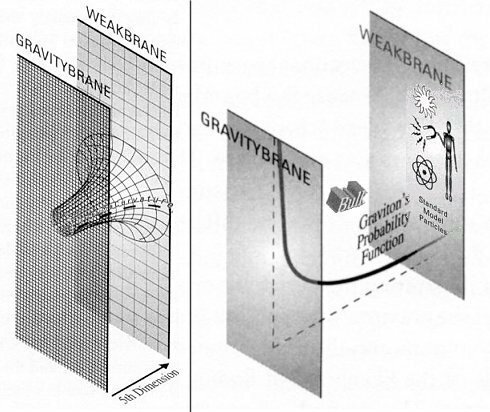 The interaction terms involve the gravitational field interacting with the energy-momentum density, and the electromagnetic field interacting with the charge-current density. quarks and leptons. Such formulism is called supergravity. 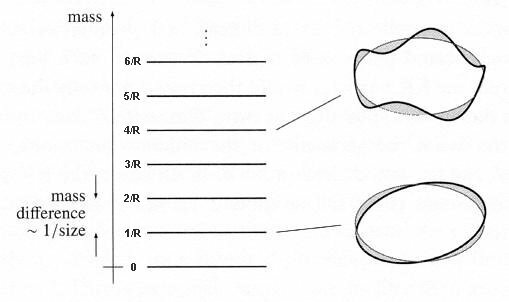 The decomposition is illustrated in a much simplified form in Figure 10t. It seems that everything is there. The most serious problem with quantum Kaluza-Klein theory is that it is non-renormalizable; and the fact that certain particles are missing in this picture eventually forces physicists to develop a more powerful formalism: the superstring theory. But the central theme of Kaluza-Klein theory remains: the physical laws depend on the geometry of hidden extra dimensions. e.g., an electron/positron pair, from the predicted KK graviton (Figure 10ub). The model of Gravity Leak to Extra-dimensions provides another prediction on KK particle production.